Can the Republican Party Reclaim Lincoln? 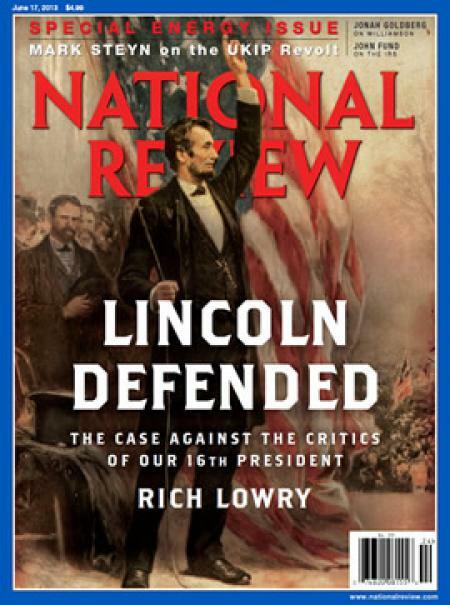 Next month National Review editor, Rich Lowry, is publishing a book about Abraham Lincoln. Part of the project is an attempt to reclaim Lincoln from the extreme Libertarian Right of Thomas DiLorenzo and Walter Williams, among others. In the most recent issue of NR Lowry offers a taste of his forthcoming book. The anti-Lincoln critique is mostly, but not entirely, limited to a fringe. Yet it speaks to a longstanding ambivalence among conservatives about Lincoln. A few founding figures of this magazine were firmly in the anti-Lincoln camp. Libertarianism is rife with critics of Lincoln, among them Ron Paul and the denizens of the fever-swamp at LewRockwell.com. The Loyola University Maryland professor Thomas DiLorenzo has made a cottage industry of publishing unhinged Lincoln-hating polemics. The list of detractors includes left-over agrarians, southern romantics, and a species of libertarians — “people-owning libertarians,” as one of my colleagues archly calls them — who apparently hate federal power more than they abhor slavery. They are all united in their conviction that both in resisting secession and in the way he did it, Lincoln took American history on one of its great Wrong Turns. I don’t know whether Lowry does so in his book, but part of the project of reclaiming Lincoln for the Republican Party might involve dismantling the myth that the Confederacy represented a beacon of small government and respect for states rights. As I’ve shown on more than one occasion nothing could be further from the truth. Perhaps Lowry could compare Lincoln with that other advocate of Big Government, none other than Robert E. Lee. Here is what Gary Gallagher has to say about Lee in his new book, Becoming Confederates: Paths to a New National Loyalty. Add to the mix Lee’s eventual call to recruit black soldiers and you have yourself a Confederate nationalist in the first degree. If the government needs it, the government has the right to take it. I don’t advise playing political football with the past, but if you are going to do so than you should go all in. I think this is a necessary first step on the road to rehabilitating the GOP as a party that is open to rational thought. It is easy to do, if you know the history, and doesn’t touch many current hot-button issues. My dad was a Republican as well as a member of the ACLU and the Sierra Club. Reclaim Lincoln? The GOP really exists because of Lincoln. The Democrats are right to reject the Dixiecrat strain in their party, but why the Republicans would villainize Lincoln (and people like Teddy Roosevelt) is beyond me. Unless the Republicans want to become a regional revanchist party, they should look to Lincoln, whose progressive nationalist vision once inspired generations of young Republicans, as a guide to the future. I don’t know many Republicans that “villify” Lincoln. Those that do probably identify more as conservatives than Republicans. I think both parties can and should look to Lincoln if not for anything more than his humility and decency in how he handled himself politically. The political sands have shifted so much that you can see strains of Lincoln, T.R. and even JFK in both parties these days. These figures don’t belong to a single party, but rather to all of us now as a part of history, and claiming them usually means ignoring the context in which they operated, which is inseperable from individual policy positions they took. I think you are right about that. This particular narrative is confined to a relatively small group. It’s probably as reflective of Republican views of Lincoln as is Howard Zinn’s for the Left, which is equally bad. I will also note that when i teach my quick course on American history for immigrants, the only president my students identify with is Lincoln. They see him as a poor campesino who rose to greatness in spite of the odds, something that until very recently could not happen in their countries. I have had immigrants come up to me and say “I love Lincoln”, something I’ve never heard said about any other president. In the case of what Lowry refers to as “southern romantics,” they generally seem to assert loudly that mainstream, non-Tea Party Republicans are just as bad as the Democrats, and they can’t support either party. I have my doubts about whether many of them actually refuse to vote GOP on election day, but that’s another story. It’s not coincidence that the loud, activist base that is currently guiding the GOP skews exactly the same way Confederate “heritage” advocates do — white, old, and Southern. They really do pine for a day when things were, relatively speaking, very good for them, but at the expense of pretty much everyone else in terms of economic and educational opportunity, and political power. Those days are gone, and thank goodness for it. I wonder if Lincoln were alive today he would identify with the party he helped found. I doubt it. The Republicans of today resemble the Democrats of the mid 19th Century. That is part of the problem for Republicans. People identify with Lincoln but not his party. I think saying that the Republican party of Lincoln’s time and that of today are the same party is like saying that Old English (not Shakespeare’s English, but the English spoken in Anglo-Saxon times 1,000 years ago) and today’s English are the same language. In both cases yes, they are in theory, but for all practical purposes they’re separate entities.